Although ‘Dead Water’ may sound like the title of a movie that will make you steer clear from swimming in the ocean for a year, it is actually the name for an interesting fluid-dynamic phenomena experienced by nautical vessels (and, as it turns out, a detective novel by Ngaio Marsh). Right then…back on track. Dead Water describes an effect wherein a vessel (i.e. a ship) that is moving by way of thrust produced below the water line (i.e. a propeller) begins to slow, sometimes even to a complete stall due to a mysterious force that seems to be dragging the vessel backwards. How does this happen? Well, there are things called internal waves; essentially, these are waves that appear much as the usual surface waves that you might think about when you picture ships at sea, but that exist below the surface at the interface of fluids existing at different densities. It is important to note, however, that an argument can easily be made to refer to internal waves as a type of mechanical (as opposed to electromagnetic or seismic) surface waves, as surface waves are waves that exist at an interface between differing media…just like internal waves, the usual distinction being that surface waves are generally referred to as those at an interface between a liquid and gas (i.e. the ocean’s surface and the air above the surface), while internal waves would be between a liquid and a liquid. You may recall doing an experiment growing up where you took water (dyed blue or red, etc.) and put it in a 2L bottle with some sort of cooking oil; because the two fluids were of different densities, they did not readily mix, but rather remained stratified. If you slowly rocked the bottle side to side (to avoid mixing the fluids), you created an internal wave! This is the kind of wave we are talking about right here, but rather than being produced by your hand moving a bottle, it is being produced by a ship’s propeller beneath the water. In essence, the ship’s propeller is inserting energy into the fluid (the ocean), and this energy is being used to create an internal wave at the internal interface. As the ship continues to input energy into the fluid, the wave grows in amplitude, until eventually (much like waves at the beach), the wave breaks. When the wave breaks, it crashes against the boat; the reason you do not see direct contact between boat and wave in the above video is that the boundary layer between the boat’s hull and the far removed water is keeping them separated, but (rest assured) the energy of the breaking wave is transmitted through the boundary layer into the boat’s hull. This wave breaking creates local turbulence around the propeller, which further draws energy from the boat’s thrust (in addition to the thrust energy still being taken up by the waves forming down the line). The next part is a simple logical progression: if a boat uses a propeller to introduce energy into a fluid to produce thrust, then if an external force (i.e. internal waves) is taking up energy from the propeller, then it is also taking up energy from the production of thrust, then this translates to the boat not producing as much thrust as before and thus slowing down, perhaps even to a standstill (if the boat no longer has enough thrust to defeat the drag forces). With the ship slowing down and possibly even stopping, even though its propeller(s) is(are) rotating at a constant speed, it is understandable how nautical travellers might have coined the term ‘Dead Water’ for something that they likely first perceived as being due to some crazy, mysterious sea monster that wouldn’t let them go, making them dead in the water…get it? One last word on this topic…why is there these fluid interfaces in the ocean to begin with? 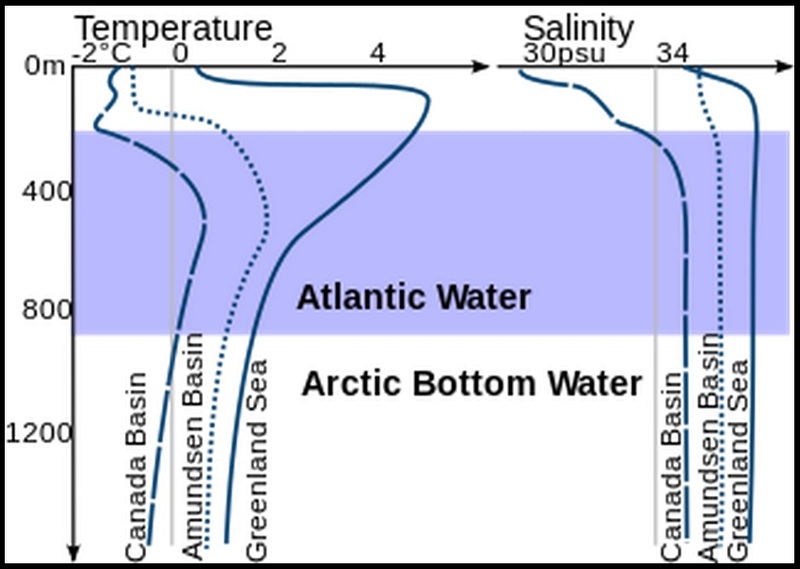 Well, this stratification in ocean waters is caused by many factors, but mainly the difference in temperature, salinity (salt content), and thus density. For this reason, nautical goers are more likely to encounter Dead Water in regions with large salt inlets or largely varying water temperatures, such as near sources of inland fresh-water runoff into the ocean, or near glaciers. ← My Time as a Technical Blogger…So Far!